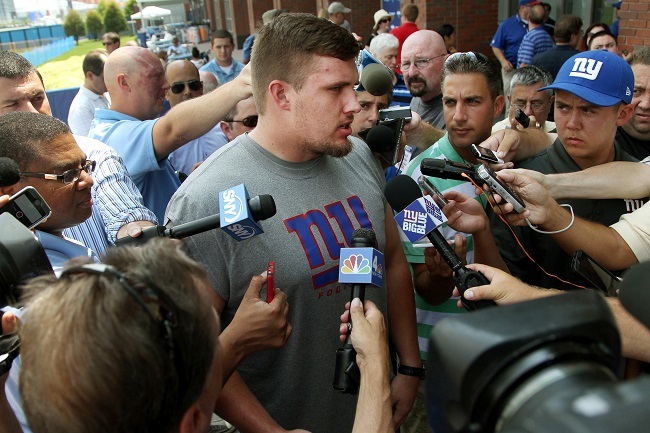 There was little hesitation from Weston Richburg. Actually, there was none at all. He spit out his answer before the question was done being asked. Are you where you want to be in your develop…. Initially, there was some confusion. This was, after all, the Giants new starting left guard. The team’s pro-ready second-round pick who was expected to compete for a starting position before being thrust into one due to injury. How could he not be where he wanted to be? But the puzzled look on those staring back at Richburg quickly changed. No, he’s not where he wants to be right now, and there’s a simple reason for that. With the injury to Geoff Schwartz, Richburg will have to progress a bit quicker than originally anticipated. Versus the New York Jets on Friday, Schwartz, who signed a four-year contract with the Giants this offseason, suffered a dislocated toe in the second quarter. Schwartz will have his foot examined by foot specialist Dr. Rob Anderson early in the week to determine the severity of the injury. Schwartz could be out months, Schwartz could be out the season. Either way, Richburg has gone from fighting for a starting position to holding one. For as long as Schwartz is on the sideline, Richburg will be in the huddle. Through training camp, the versatile Richburg has been juggling the task of not only learning his first NFL playbook, but three separate positions. The 23-year old has seen time at left guard, right guard and center during practices and the preseason. Richburg has acknowledged he feels his game is making strides as he gets more comfortable with Ben McAdoo’s scheme and used to facing pro-level defensive lineman, but there’s one part of his game he feels he’s doing the best. It’s not run blocking or pass blocking, nor is it any specific pancake block. It’s simple, really, Richburg loves the fact he’s able to forget. “If I make a mistake, I’m able to clap it off and then go on to the next play,” Richburg said. “I think that’s something that sometimes can hurt players. It carries on play by play.